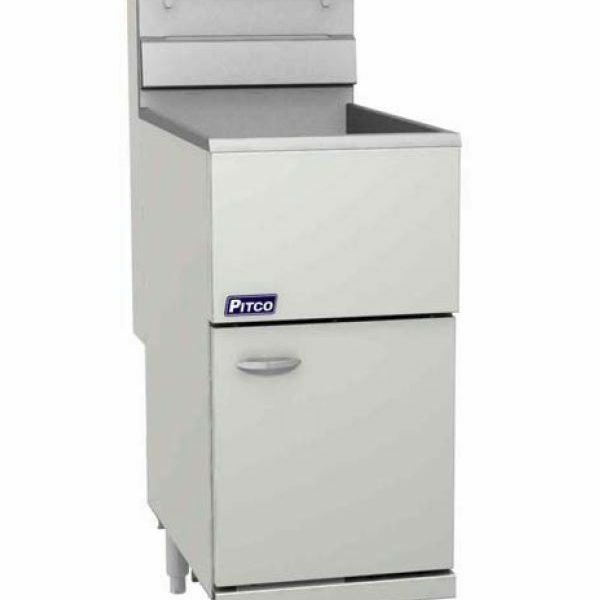 Welded tank with an extra smooth peened finish ensures easy cleaning. Long-lasting, high-temperature alloy stainless steel heat baffles are mounted in the heat exchanger tubes to provide maximum heating and combustion efficiency. Standing pilot light design provides a ready flame when heat is required. 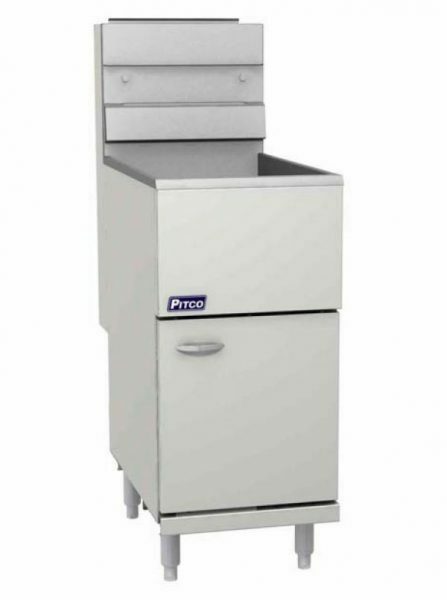 Cabinet front and door are constructed of stainless steel with galvanized sides and back. Thermostat maintains selected temperature automatically between 200°F (93°C) and 400°F (190°C-CE). Integrated gas control valve acts as a manual and pilot valve, automatic pilot valve, gas filter, pressure regulator (for gas pressure higher than ½ psi needs external regulator), and automatic main valve. Gas control valve prevents gas flow to the main burner until pilot is established and shuts off all gas flow automatically if the pilot flame goes out. Temperature limit switch safely shuts off all gas flow if the fryer temperature exceeds the upper limit. Front 1-1/4” (3.2 cm) NPT drain for quick draining. Standing pilot and thermostat maintain temperature automatically at the selected temperature (between 200°F (93°C) and 400°F (190°C-CE). 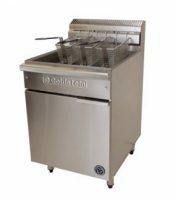 “V” pan fryer combines high energy efficiency, quick response and recovery and cooking flexibility. +/- 2oC precision thermostat for optimum control. Rapid heating response and continuous pilot ignition. 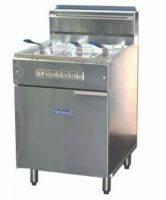 Flat bottom fryer for maximum food type flexibility. 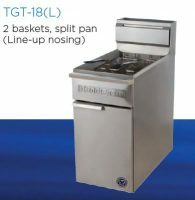 Unique pan design maximises heat transfer to minimise energy use. 2 & 3 basket models available. Turbo gas tube type fryer provides a quick recovery along with the benefit of energy efficiency. Large cool zone for long oil life. Stainless Steel pan for easy cleaning. All models available with & without line-up nosing. 2 basket and 3 basket models available.